“How are we setting up new leaders for success?” That question isn’t being asked in enough boardrooms. Fifty-nine percent of managers overseeing three or fewer employees reported that they had no training at all, and 41 percent of managers overseeing three to five employees reported the same, according to a study by West Monroe Partners. So, how are they learning how to manage? Forty-two percent of managers said they simply copied what an earlier manager did. And considering that a majority of managers said they’re too busy to provide feedback to their team, many simply aren’t learning how to manage at all. Clearly, your new leaders need additional support. This required reading list will put new managers—and your business—on a path to success. First and foremost, we need to understand why new managers are stumbling. The aforementioned West Monroe Partners survey found that many managers didn’t understand the responsibilities of their new role. Meanwhile, 35 percent said expectations weren’t clearly defined or communicated. In other words, many new managers struggle to grasp the basic concepts of managing. William Gentry, a senior research associate at the Center for Creative Leadership and a leading authority on leadership development, explains that new leaders often find that the technical know-how and independence that help people excel as individual contributors do not help them in leadership roles. Rather, they have to learn a new set of skills to effectively manage or lead. The first step is changing from the mindset of an individual contributor to the mindset of a leader. 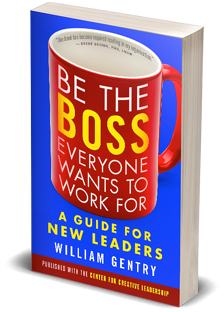 Find Be the Boss Everyone Wants to Work For on Audible, Amazon, Barnes and Noble, Indiebound, or the BK Bookstore. The business climate has changed a lot in recent years. Renowned researcher and thought leader on effective managing, Henry Mintzberg summed up the challenge in his seminal 2009 book, Managing. “Finding out what managers do is not the problem; interpreting it is. How do we make sense of the vast array of activities that constitute managing?” he wrote. Mintzberg has distilled Managing into the leaner, updated version, Simply Managing: What Managers Do—and Can Do Better. 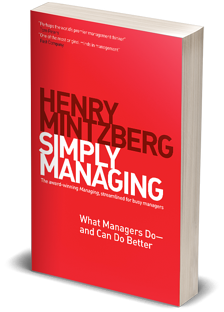 In Simply Managing, Mintzberg explains that management is not a profession, but a practice. And the practice of management requires a blend of artistic vision and creative insights, scientific analysis of systematic evidence, and the experiential craft of practical learning. “Managers deal with the messy stuff—the intractable problems, the complicated connections,” he writes. “This is what makes their work so fundamentally ‘soft’ and why labels such as experience, intuition, judgment, and wisdom are so commonly needed to describe it.” Simply Managing offers a host of helpful insights to deal with the relentless pressures of being a manager, the technique of “managing through information,” and how to confront common conundrums of managing. Simply Managing can help new managers not merely understand their new roles—but thrive in them. Find Simply Managing on Audible, Amazon, Barnes and Noble, Indiebound, or the BK Bookstore. You’ve probably heard the axiom “it’s not what you say—it’s how you say it.” Well, this speaks volumes in the workplace. A new study has found that workplaces are more creative, innovative, and collaborative when employees view their leaders as humble. Edgar H. Schein, an authority on workplace learning with a career spanning a half century, explains that a specific type of humility, “here-and-now humility,” might be the key. In his book, Humble Inquiry, Schein writes that here-and-now humility occurs when we’re forced to depend on others or when we need something. A leader who tells employees to do things in these situations implies that the employees are ignorant and subordinate. A leader who asks, however, temporarily empowers the employee, while making herself, the leader, vulnerable. “(Asking) implies that the other person knows something that I need to or want to know. It draws the other person into the situation and into the driver’s seat; it enables the other person to help or hurt me and, thereby, opens the door to building a relationship,” Schein explains. The art of humble inquiry, however, requires more than simply asking questions. It requires asking the right type of questions. 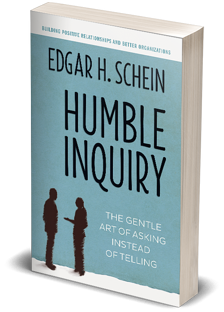 At its core, “Humble Inquiry does not influence either the content of what the other person has to say, nor the form in which it is said,” Schein writes. New leaders can learn to ask for information in the least threatening or biased ways possible. Also, learning to demonstrate genuine interest in the employees’ responses is especially helpful. “We take it for granted that the boss is always telling us things, we expect that; genuine interest from the boss is much rarer and much more appreciated,” Schein writes. By leveraging these skills, new managers can promote accountability, inspire satisfaction and happiness in employees, encourage teamwork, and reduce potential feelings of conflict. Find Humble Inquiry on Audible, Amazon, Barnes and Noble, Indiebound, or the BK Bookstore. Would you believe that self-awareness can be more helpful to leaders than an MBA? After a review of multiple multi-year studies, the Harvard Business Review has reached that conclusion. The report’s authors concluded that “the leadership approach is out of balance” when “MBA-trained logic becomes the sole focus” of managers. Self-deception can be best described as “the inability to see that one has a problem,” the book states. When leaders fail to see that they have problems, they’re unable to effectively address them. Even worse, they might try to use solutions that actually make the problem worse. Leadership and Self-Deception serves as a helpful guide to building stronger relationships, resolving conflicts, increasing performance, and achieving your goals. 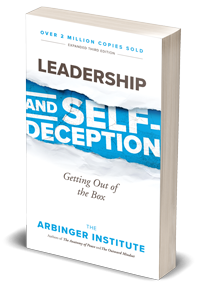 Find Leadership and Self-Deception on Audible, Amazon, Barnes and Noble, Indiebound, or the BK Bookstore. When new managers don’t have the ability to convey an inspiring strategic vision, they often tend to focus, instead, on tactics. 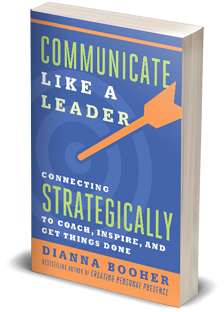 In her book, Communicate Like a Leader, author Dianna Booher writes, “Tactical thinkers get things done. Strategic thinkers get the right things done. Tactical communicators tell others how to get things done. Strategic communicators lead others to get the right things done.” For most new leaders, strategic communication is a learned skill. Conversely, tactical communication can be a bad habit. Booher warns that it creates undue stress in employees, diminishes productivity, and fuels turnover. Communicate Like a Leader can help new managers develop the communication skills they need to succeed in leadership. The book serves as a field guide to applying strategic communication in different realms of the workplace: employee development, conversations, negotiations, speaking, writing, and meetings. “Strategic communication forms the very core of leadership. When you as a leader speak, meet, negotiate, write, or network, you either clarify or confuse, motivate or demoralize, engage or enrage employees. And they, in return, will either give 110 percent of their loyalty, support, and skill to accomplish your mission—or disengage, divert your focus, and drain your energy in dealing with them,” Booher writes. Find Communicate Like a Leader on Audible, Amazon, Barnes and Noble, Indiebound, or the BK Bookstore. Some view managing as privilege—but others view it as a punishment. Surprisingly, just 34 percent of employees said in a CareerBuilder survey that they wanted to serve in leadership positions. How can you draw the reluctant leader out of her shell? Devora Zack, the president of Only Connect Consulting and an expert on leadership development, explains the leadership quandary like this: Most people pursue career paths that they’re passionate about—and management is not their passion. In Managing for People Who Hate Managing, Zack has provided a fun and helpful guide for new managers to learn new skills that enable them to love their new leadership roles. Zack’s first (and only) hard-and-fast rule? Be you. Becoming a manager changes your job title, not your personality. And that’s okay. The goal, Zack writes, is to balance useful guidance and getting out of the way. “Getting out of the way, once we get the hang of it, is easy. It means stepping aside and letting others do what they’re there to do, rather than suffocating them with our interference and brilliant plans. Useful guidance is providing structure, sharing expectations, and being available to contribute to others’ success,” she writes. Throughout the book, Zack provides fun anecdotes, interesting statistics, and helpful advice for new managers to embrace their new roles without letting them change who they are. 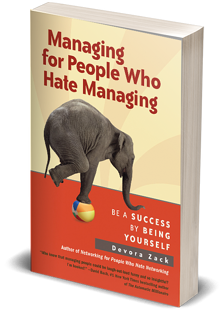 Find Managing for People Who Hate Managing on Audible, Amazon, Barnes and Noble, Indiebound, or the BK Bookstore. New managers face a daunting task. In an instant, they go from being an individual contributor to being accountable for team and organizational success. At the same time, they have to grapple with changing roles and relationships, they have to resolve conflicts, they have to motivate and inspire team members, and they have to do it all with an eye on their organization's long-term strategic goals. No wonder most employees don’t have an interest in being a manager. The solution is to provide support and resources to facilitate the transition from individual contributor to new manager. This required reading list can help show the way.